The 16.5.2 release of SQL Server Management Studio (which reports as 13.0.16105.4 in the About screen) has a bug where you cannot display a list of tables in databases that contain sparse columns. You get a “Subquery returned more than 1 value.” error as shown below when you try to expand the Tables node. This has been reported here and here. Upvote the Microsoft Connect Item here. The fix is to roll back to a previous version. It’s a SQL Server best practice to have Auto Create Statistics enabled on your databases. When this is on, SQL Server will create statistics on single columns when it needs them. However if someone comes along later and adds an index, that auto-created statistic might not be needed any longer. When an index is created, SQL creates a statistic on the columns in that index. If the first column in that index was a column that SQL had previously auto-created a statistic on, you’ve now got duplicate statistics on that column. Is this bad? Maybe. A duplicate statistic can impact storage space and performance. Statistics are relatively small objects in a database – they contain a maximum of 200 rows in the histogram and a very small amount of data in the density vector and header. Therefore, the impact on storage space is very minimal, but definitely not non-existent. The biggest impact of duplicate statistics would be manifested as decreased performance. We all know too many indexes can slow down table inserts, deletes, and updates because SQL has to update all those indexes each time data is modified. The same situation exists with statistics. The more there are, the more SQL has to modify as data in the table changes. It’s not quite as bad as indexes because the number of data modifications has to reach a certain threshold before statistics are updated, whereas for indexes every single data modification of a column used by an index requires an index update. Nevertheless, the potential exists for SQL to have to do more work than it needs to when you’ve got duplicated statistics. But that’s not the only way performance can be affected. 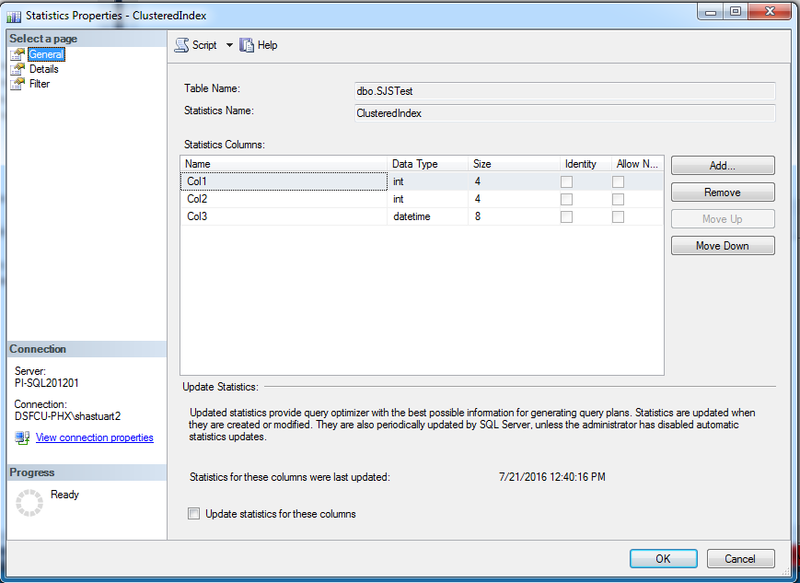 As Erin Stellato points out in the comments to her blog post, it’s possible that SQL Server will pick a column statistic over an index statistic or vice-versa when generating a query plan. If one of these stats is out of date and that is the one SQL picks, a less-than-optimal query plan might be generated. So it may be worth checking your databases for duplicate statistics, especially if you have a highly active database that you have recently added indexes to. 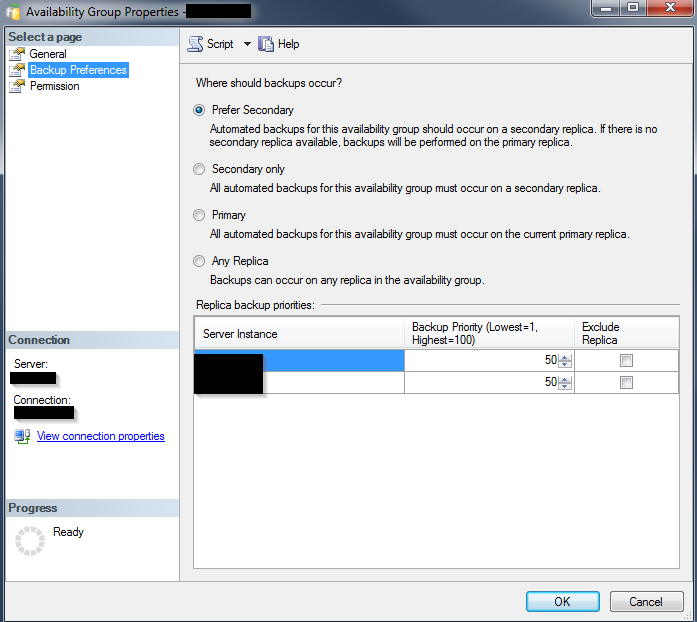 Being the good DBA that I am, I decided to do this check on my SQL Servers. I found a handy script at https://mattsql.wordpress.com/2013/08/28/duplicate-statistics/. The code looked ok, so I ran it against one of my smaller databases and removed the statistics it said were duplicates. I re-ran the query and, sure enough, it returned no rows, meaning it found no more duplicates. Then I saw something shiny and got distracted. When my focus returned to SQL, I ran the query again – accidentally against the same database I ran it against earlier. Strangely, this time it reported it found some duplicate statistics. Hmm. That shouldn’t have happened. If SQL auto-created statistics again, it meant that it needed them – which meant that the stats on the indexes I thought were duplicated were not actually duplicates. You would think that would select the first column in the index. That’s even what you might expect from reading the MSDN page for the view. Except that’s not always the case. If you want to find the first column in the index, you have to select the record where key_ordinal = 1, not index_column_id =1. Clearly, we defined the index with ObjectID as the first column. Now, let’s run a query that joins the sys.index_columns view with sys.indexes and sys.objects (so we can see some names instead of just object IDs) and see what we get. Recall the column order we defined for our index: ObjectID, ObjectTypeLID, and TypeLID. We can see that index_column_id does not number the columns in that order. It is the numbering in the key_ordinal column that indicates the order the columns are defined in the index. This explains the behavior I was seeing. Because the script I used incorrectly identified the initial column the index statistic was created on, it incorrectly identified an auto-created statistic as a duplicate. Luckily, because I have auto create statistics enabled, I didn’t cause much chaos when I deleted the incorrect statistic – SQL Server just made a new one when it needed it. In testing, I also ran across one more issue – namely auto-created statistics that have more than one column. I know this is supposedly not possible, but I discovered a weird case where it can happen. I wrote about it in some detail last week, so check that out if you are interested. Bottom line is this situation might occur if you are working with a database that was created in SQL 2000 (or possibly earlier). What this meant for my script is that, due to the join on the sys.stats_columns table, some statistics might be incorrectly flagged as being duplicated when they really aren’t. Again, this would only happen in the strange case where you were working with an old database. Nevertheless, if you are concerned about this, perhaps because you know performance in your environment is highly dependent on statistics and the overhead of auto-creating them in production could cause issues, look over the script output before running it. Any suspect statistics would be named _WA_Sys_<column name>_<hex ID of table> instead of the newer format _WA_Sys_<hex id of column>_<hex ID of table>. Don’t run the commands with the column name instead of the hex ID. Instead, run those commands during an outage window and then manually re-create the statistics, taking care to identify which column that stat is for and which ones were the included clustering keys. This will re-create those stats as the newer format single column stats. I took Matt’s script as a starting point and I made the correction to the CTE. Because I wanted to run this script against a bunch of databases, I also modified it to cycle through all the databases on the SQL Server instance. I also changed it to output the commands to drop the duplicate statistics. The script below will cycle through all user databases on a server, looking for auto-created statistics that are on a column that is also the first column in an index on the table. It ignores disabled and filtered indexes and will output a list of commands that drops the duplicate statistics. You can then take this output and run it against your server to remove these statistics. The script itself makes no changes to any database. If you want to see the details of which statistic is duplicated by which index, simply uncomment out the second to last SELECT statement in the script. This script was tested against SQL 2012. I suspect it may not work with partitioned indexes – I did not test it against those. Also note that this script only finds duplicate statistics between stats that were auto created and those from an index. It will not find duplicate between two column statistics. For example, if SQL auto created a stat on a column and someone later manually created one on the same column, this script would not find this. This script has been tested against SQL Server 2008 R2, 2012, SQL 2014, and SQL 2016. It does NOT work on SQL 2005 and earlier. This script makes no changes to any databases. Seems pretty clear. SQL Server will not automatically create multi-column statistics. I’ve heard this over and over from many different sources. I puzzled over this for quite some time got nowhere. I finally reached out to the SQL Server community for help. Erin Stellato (b | t) said she had never seen that before, but she did mention the naming of the statistics seemed strange. I noticed this as well. As Paul Randal has blogged, auto-created statistics are named as _WA_Sys_<hex value of column>_<hex value of table>. Typically, the names look something like _WA_Sys_0000000D_00000029. But these stats don’t follow that format. Instead of the hex value for the column, they have the column name. Aha! It seemed highly likely that this was the cause of what I was seeing. Although I was working with a database on a SQL 2012 server, I was pretty sure that database was originally created on an older version of SQL. I wanted to confirm this however. To verify what SQL version the database was created with, I used the DBCC DBINFO command. 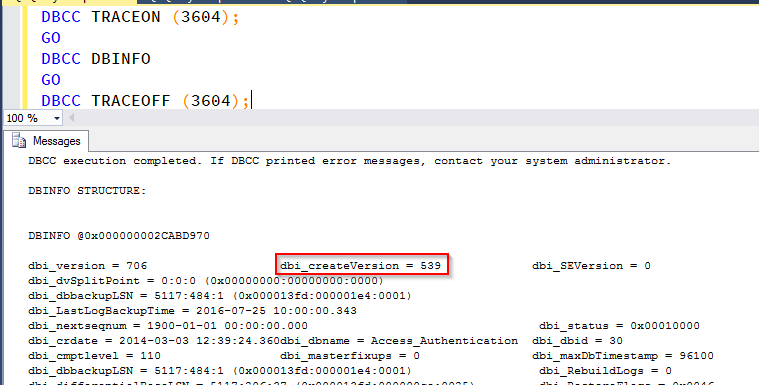 The value of the dbi_createVersion field indicates what SQL version was used to create the database. Thanks to Paul Randal’s TechNet post, we know that a value of 539 means the database was created with SQL 2000. Looks like Paul White might be on to something. 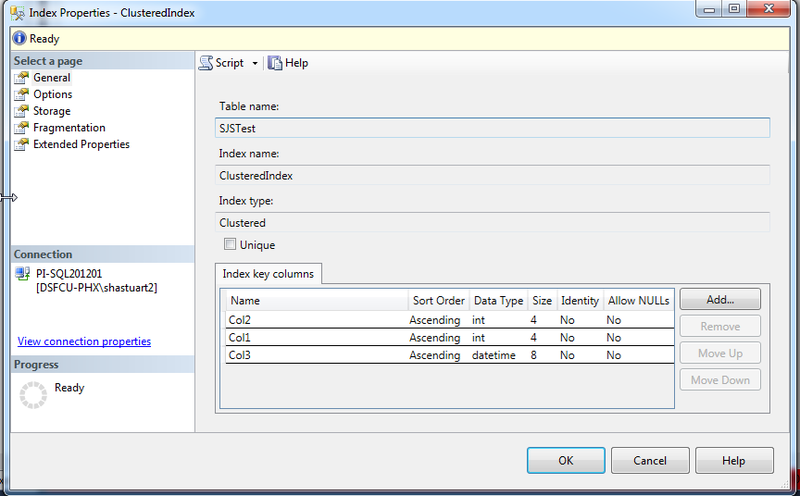 The next piece I wanted to verify was that auto create stats for SQL 2000 included the table’s clustering key. Unfortunately, deep dive details for auto-create stats for SQL 2000 are somewhat hard to come by these days and I was not able to find anything that definitely stated the clustering key was included. However, in all the auto-created stats in all the old databases I found on my servers, this was the case. I also verified that if the clustering key was more than one column, all the clustering columns were included in the auto created stats. I’m going to go ahead and assume this is the way it worked back in the day. And finally, I wanted to find something confirming the naming convention. Again, details were hard to find, but I did find this ebook which states that the names of the auto-created statistics in SQL 2000 use the column name, not the hex value of the column. This is enough evidence for me, so I’m going to call it: I’m going to go ahead and say that auto created column statistics can be created on multiple columns. Granted, you have to be running SQL 2000 and the additional columns are always the clustering key columns, so it’s very specific case and it no longer happen in modern versions of SQL Server. P.S. Just for kicks, I deleted one of the old, two column stats and ran a query so that a new stat would be created. Would the new statistic follow the old or new SQL Server rule? Turns out, not surprisingly, the newly auto-created stat followed the new rules: it was single column, did not include the clustering key, and followed the new naming convention using the hex value for the column name. This was tested using SQL 2012. I also wanted to see what would happen if the database was running in SQL 2000 compatibility mode. On a SQL 2005 server, I found a database that was created in SQL 2000 and had some of these strange auto-created stats. I changed the database to SQL 2000 compatibility mode, deleted one of the auto-created stats, and ran a query to force a new one to be created. The result? A single column stat that did not include the clustering key and that was named using the hex id of the column. In other words, the stat was made using the method we see in newer versions of SQL Server. So the database compatibility mode does not affect this. The only way multi-column auto created stats can be generated is if you are using the SQL Server 2000 (or earlier, most likely) database engine. I’m in the process of creating a post about statistics and came across something in SQL Server Management Studio that was driving me crazy. I thought I’d post it here so that others might not waste an hour or two like I did puzzling over this. 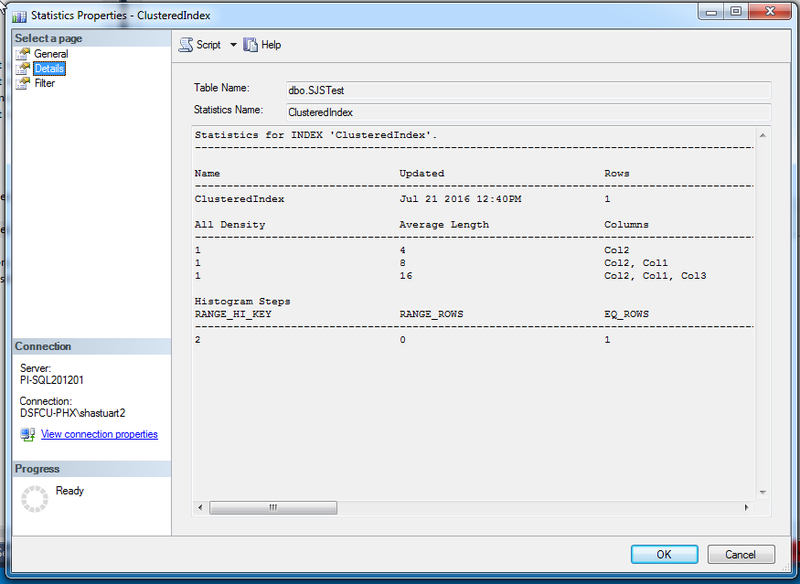 When you create in index in SQL Server, SQL automatically creates a statistic for the columns in the index. In the screenshot below, you can see my table named SJSTest, to which I have added a clustered index called, somewhat unoriginally, ClusteredIndex. 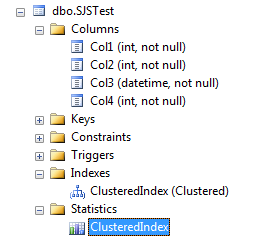 When you expand the Statistics folder, you can see SQL has automatically created a statistic with the same name as the index. At the time, I happened to be flipping back and forth between the property pages of indexes and statistics a lot and this really confused me. In the property page for an index, the columns are listed in the order the are in the index, but on the property page for statistics, the columns are displayed in the order they exist in the table. I’m using SSMS version 13.0.15600.2. It would be nice if they made in the statistics property page behave the same as the index property page in a future version. I have created a Connect item for this. If you agree, please vote for it.